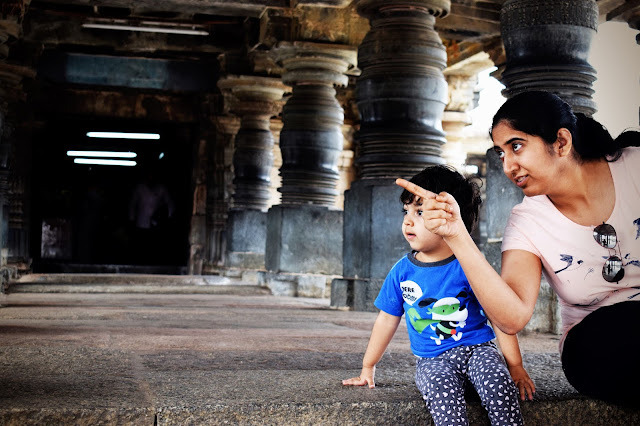 While on the trip to Chikmagalur from Bangalore, we came to know about a very famous historical architecture temple from Hoysala times (Chennakeshava) in Belur. This is on the way to Chikmagalur and so we decided to take this slight de-tour and spend a few hours here. This is around 220 Kms from Bangalore and 30Kms from Chikmagalur. Many people plan day-trips to this temple and believe me, it is totally worth it. 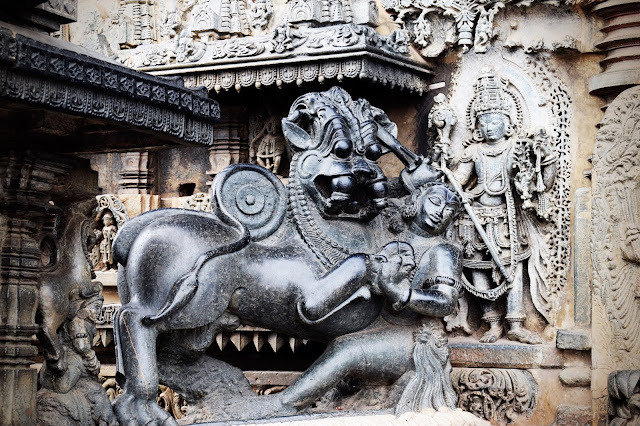 Chennakeshava (means Handsome Keshava) is a Vishnu temple which was build during Hoysala dynasty. It has a huge entrance but looks like a hidden gem in the middle of this small town. When we were driving, Google maps was showing 300 meters ahead, but there was no sign of a marvelous temple, so we were thinking if we are in the right direction, but suddenly you take a turn and its right there - its beautiful. It was built in 1117AD by King Vishnuvardhana and it seems this place was build to celebrate their military victory. You could find a lot of art-work covering their National emblem, Horses, Lions and war symbols. There is a main temple of Lord Vishnu and other small side temples of other deities. The main temple has 48 pillars and each pillar is unique in design and art. It is said that these pillars had bearings earlier and they could be rotated - later these were removed and now they are steady. It is surprising as these are really heavy stone pillars, how could they be rotated. As we revolved around the temple, we realized each wall said something in itself. There were many stories written in those stone art which gives a glimpse of our mythological stories and the age-old generations. Inside the roof and pillar are very ornate along with Lord Vishnu. They charge a ticket of Rs.30/- for Camera, and they will also switch on the halogen lamp inside for you to have a look at the intricately designed roof. Outside the temple, each wall has a story to tell.. going around looking at those stone sculptures and figuring out the story which fascinated the artists of that era is indeed a magical experience. We spent a good 2 hours at this place absorbing the ambiance and immersing ourselves into the fragrance of art and historical culture. We saw many families were actually doing a outing/picnic with food prepared from their homes and enjoying the open spaces. Lots of open space with bright sunshine and breeze makes this place a refreshing experience. As soon as we entered, we were approached by the guides - these are registered guides from Karnataka state and their rates are fixed - I think it was around Rs.500/- He takes you for a entire tour to this place. 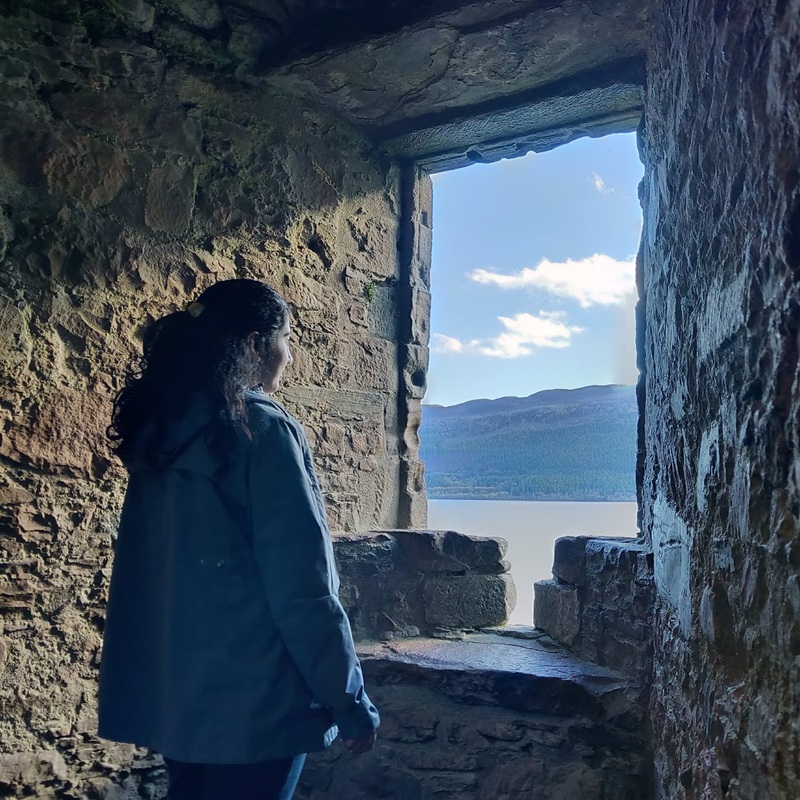 We did not hire a guide, as we were travelling with a Toddler who would not let us listen to any gyan and also we wanted to rather experience the place at our own pace. We drove our Honda Amaze from Bangalore to Belur and then to Chikmagalur trip. 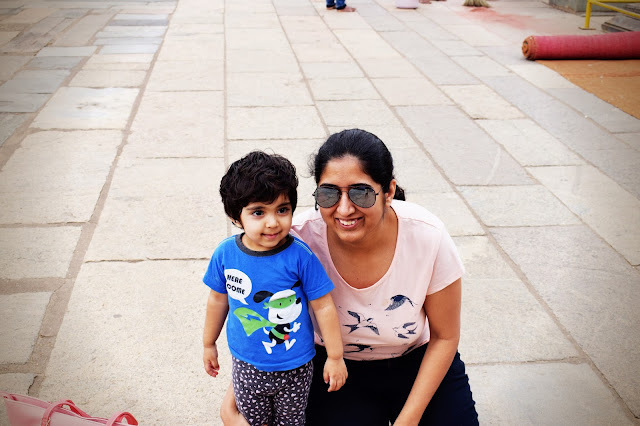 We left at 6AM in the morning from our apartment at Whitefield and reached Belur at around 11.00AM -> we also took a half hour breakfast break in between. The road is really smooth, with 4 Lane and 6 lane highways, so the vehicle really runs at good speed, only stopping for the various Toll Booths on the way which charge around 20-30 Rs per toll. Total Distance between Bangalore to Belur temple is around 220 Kms. Overall Experience : Magical. This inspires me to plan my next trip to Helibidu which has even more ornate architecture and sculptures and can be covered in a day trip. The Base is layered with 3 Layers - Elephants (symbolizing Strength and Stability), Lions (symbolizing Courage) and Horses (symbolizing speed). Beautiful pictures to relive moments of being in Belur. Those sculptures look so marvellous.